I made this costume with my wife. I love to drink red bull as I'm not a big drinker but still love to socialize and this drink is very popular at the bars and with my friends, so it was the perfect choice for me. I did my makeup to replicate a bull and used spirit gum to adhere the snout and horns to my face. I used her old earring to clip into the snout to make it look like a real bull horn. I ordered the logo shirt from the internet. I wore angel wings from an old costume of hers since the tag line for red bull is "redbull gives you wings." My wife made a tail and hooves out of mittens for me. 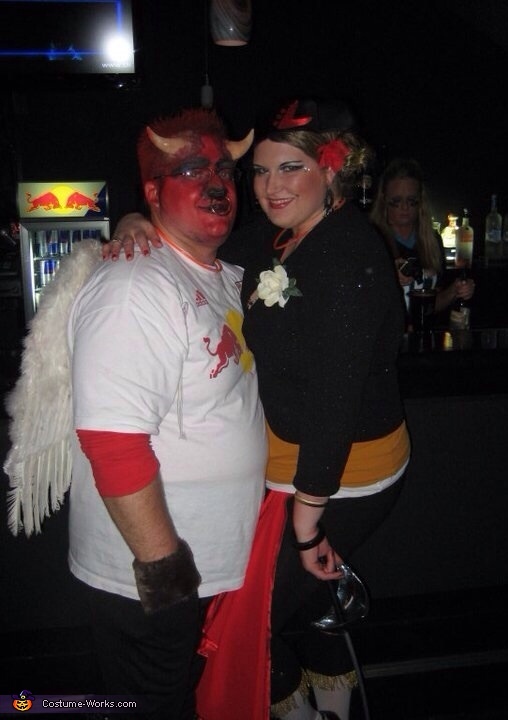 She dressed as a bull fighter so we were a bull fighter and red bull. It was a huge hit everyone got a good laugh at our cleverness. She made her entire costume and used a musketeer sword from a costume shop as a prop and also she made a red cape to flip around. She even made her hat out of cardboard and felt. She fastened a rose out of craft flowers and did her makeup like a señorita. She even made her leggings with trim and gold buttons to look like a real matador and found the bolero at goodwill. The costumes cost around $50 each to make.